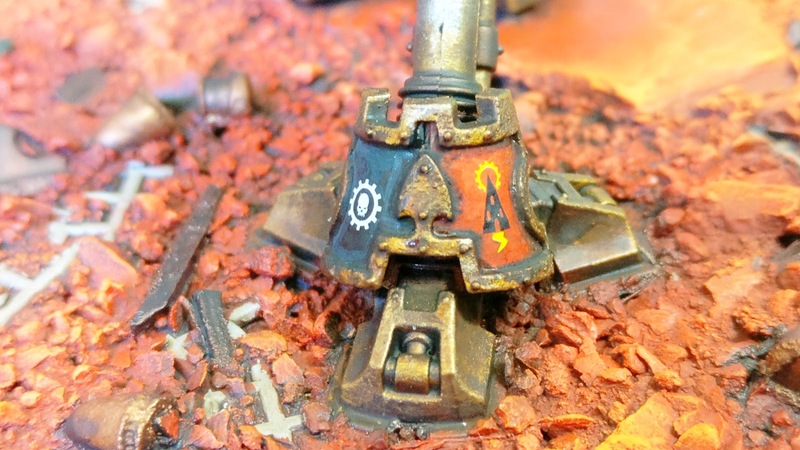 Confessions of a 40k addict: Imperial Knight - Warglaives in manufactorum pt.6 WHAT?! Decals already...! 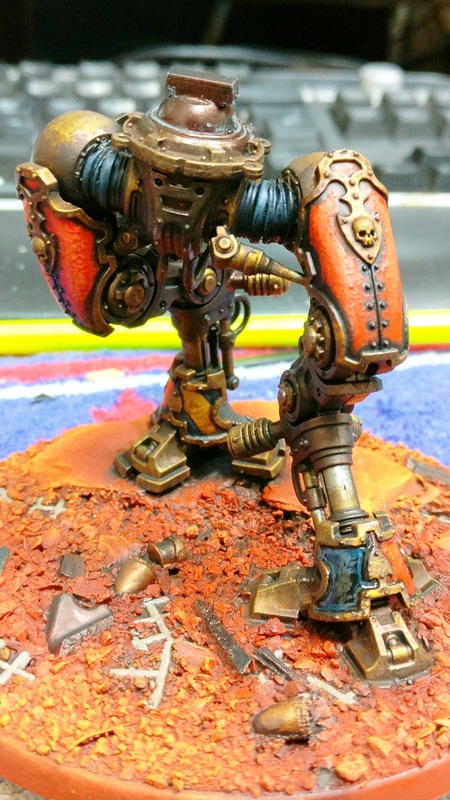 Imperial Knight - Warglaives in manufactorum pt.6 WHAT?! Decals already...! 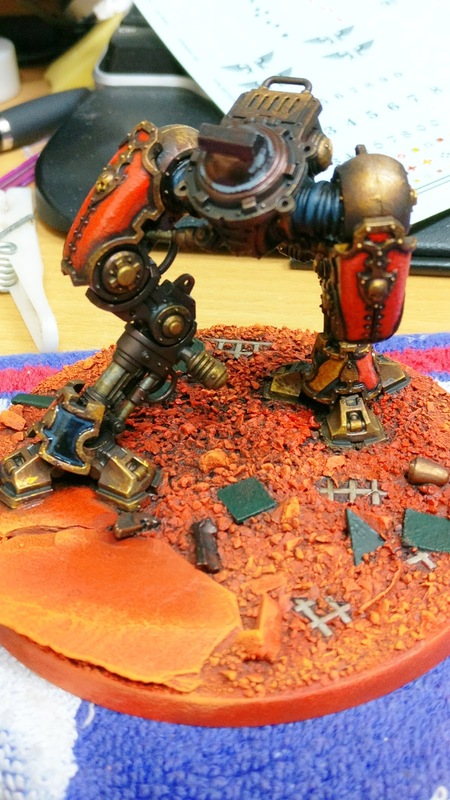 First of note I've applied a highlight to the Vermilion which here looks quite pink. 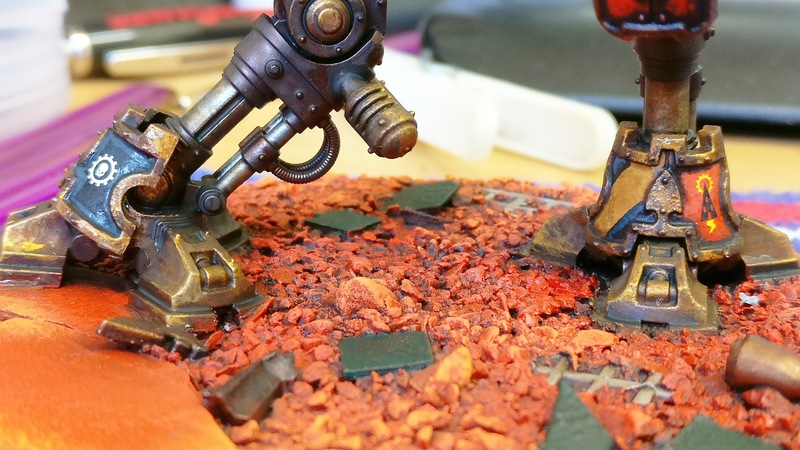 It is in fact the exact same first level highlight I add to my Red Planet BASE! so does have an orange tint to it but even so. Secondly I did some rough highlights on the chevrons - I mean REALLY rough, I think I was rushing but I don't know if I'll fix it as I think the battle damage will obscure it and potentially mitigate the 'pinkness' on the Vermilion [so no glazes to make it redder]. Lastly - gloss varnish on all the panels ready for decals. 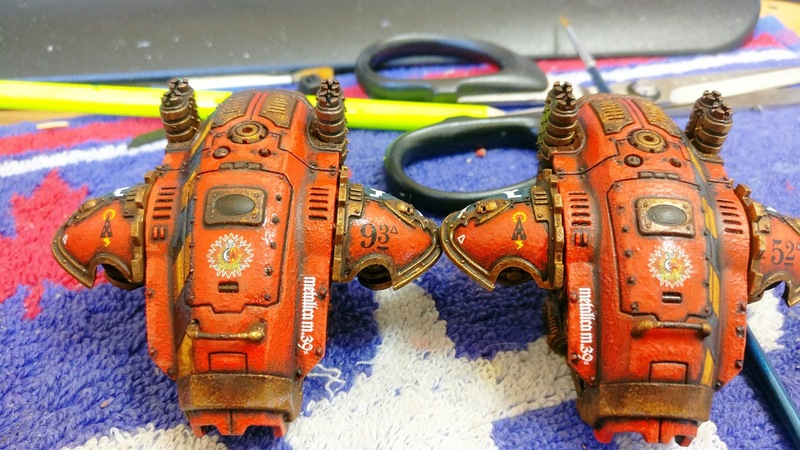 And there we go, Metallica Forgeworld names mirrored on the carapace. Raven heraldry on the access hatch, Raven symbol on the left shoulder, ident number on the right [would have preferred this in white but they actually blend better in black]. 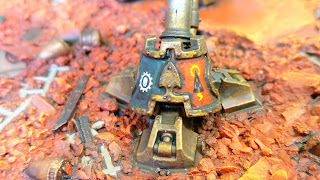 Rear of shoulder pads have the Mechanicum cog symbols. Interestingly the cogs with the square ends fit in the round bottom edge strip. 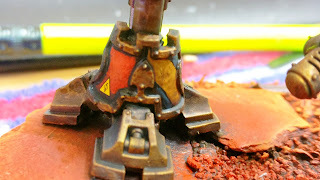 Spats with Mechanicum cog and small Raven symbol. 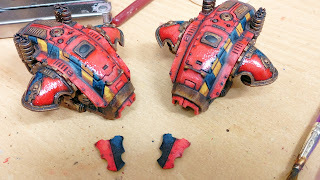 A coat of Lahmian Medium over all the decals and glossy surfaces seals everything together. 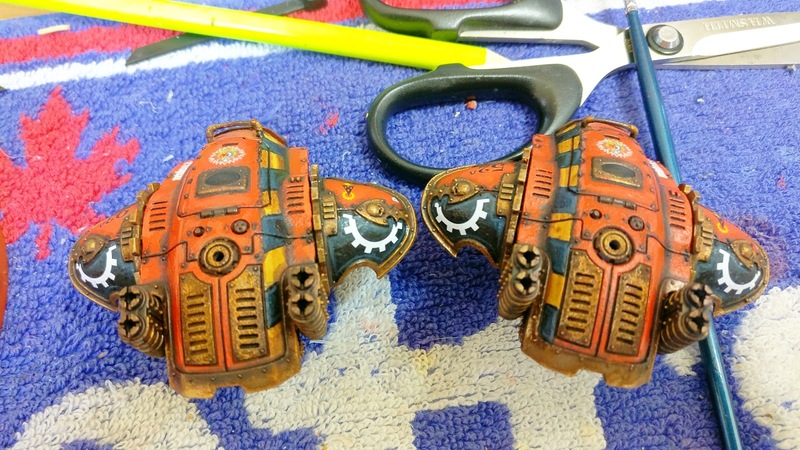 The end result is almost indistinguishable... except for the fact there is no way I could ever freehand these to this quality and the heraldry on the cockpit is such fine detail it's almost a different scale altogether. Nevermind, it looks really good and the decals are so good I couldn't not use them. And if I stick to solely decals on my Knights it 'contains' the oddity compared to my freehand everywhere else. 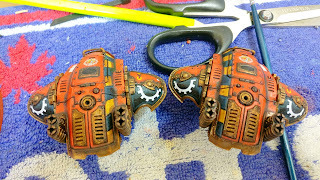 And to held blend everything I've added some Strong Tone wash over the decals just to tone them down a bit. Also started picking out the debris on the base. 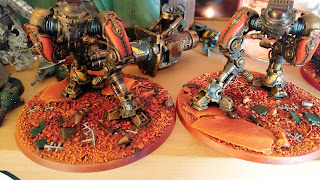 The weapons have fallen behind a bit, I still need to wash them but once they're up to speed some extra highlights, tidying up and then it's battle damage [must remember 'less is more'], Verdigris and lastly glow effects. The speed at which this is coming together is unbelievable. Just thinking back to that period where I physically refused to go any further and then suddenly I'm almost on the home stretch. Really pleased with the progress because it wasn't long ago I was focused on the Hierophant and these have come together so quick. 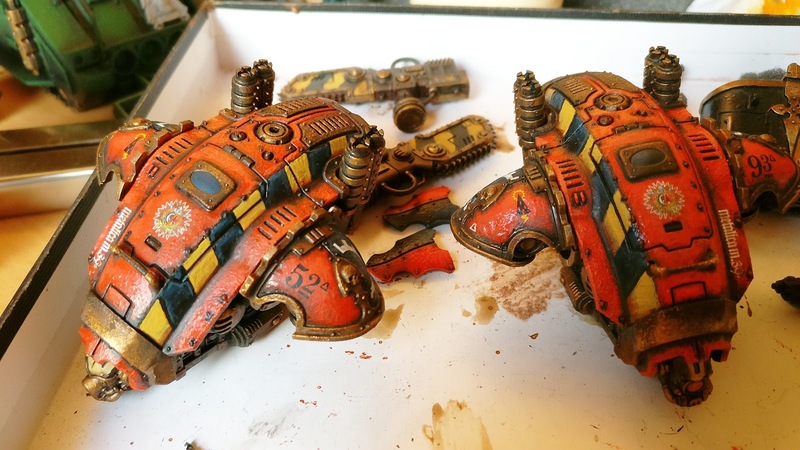 I may well get my 'Big 3' complete at this stage with just two months left of the Hobby Season!